Final delivery charges are affected by quantities chosen and delivery service selected. Estimated price above assumes "2nd class delivery" service selected. 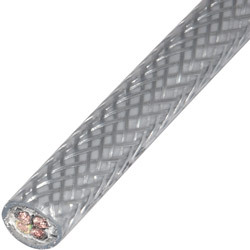 Application: Used as interconnecting cable for measuring, controlling or regulation in control equipment for assembly and production lines, conveyors and for computer units. Suitable for fixed installations or for flexible use in conditions of light mechanical stress. Can be used outdoors when protected, and in dry or moist conditions indoors. The braided screen offers the best possible protection against mechanical damage and offers a level of Electro-magnetic shielding. The galvanised coating helps protect against corrosion. Core Identification: Black with White numbers. (3 cores and above to include Green/Yellow). Coloured cores available.